Gay “propaganda” is banned in Russia, but that didn't stop a group of soccer fans from promoting LGBTQ rights in Moscow with a subtle — yet colorful — protest. Gay “propaganda” is banned in Russia, but that did not stop a group of soccer fans at the 2018 World Cup from promoting LGBTQ rights in Moscow with a subtle — yet colorful — protest. 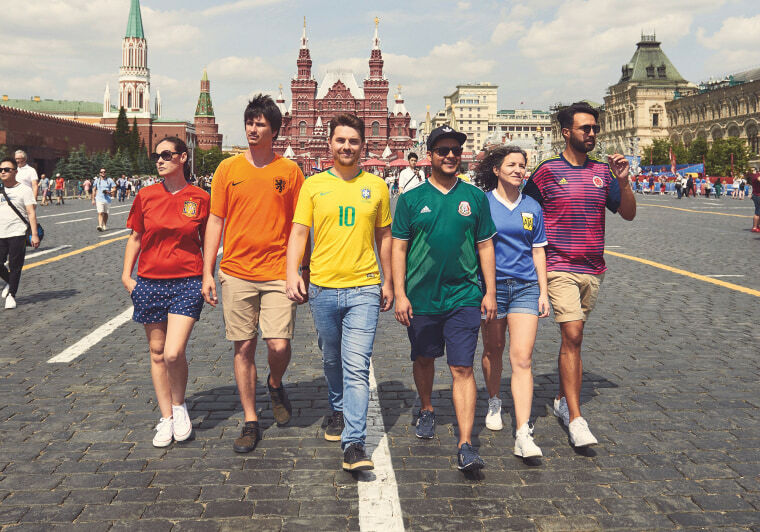 Activists from Spain, the Netherlands, Brazil, Mexico, Argentina and Colombia traveled to the Russian capital wearing their national jerseys, which conveniently create a rainbow pride flag when they line up side-by-side. The initiative, titled “The Hidden Flag,” was the brainchild of an ad agency from Spain called LOLA MullenLowe. In a statement posted to thehiddenflag.org, the agency said it was inspired to pursue the project to denounce Russia’s anti-gay policies — and it did so by using a decades-old symbol of LGBTQ pride. “In the plain light of day, in front of the Russian authorities, Russian society and the whole world, we wave the flag with pride,” the group wrote. The now-viral images show the group of six — who had never met before Moscow — chatting at a World War II memorial, listening to dimly lit live music next to a Lenin bust, relaxing by the subway under a mosaic of the Soviet writer Maxim Gorky and marching through security checkpoints in a rainbow line next to a policewoman clad in black. The motley crew of protesters included, from left to right, Marta Márquez (red jersey), president of an LGBTQ advocacy group in Spain; Eric Houter (orange), a straight man from the Netherlands participating in honor of his gay brother; Eloi Pierozan Junior (yellow), a marketing manager from a small town in Brazil; Guillermo León (green), a documentary filmmaker from Mexico; Vanesa Paola Ferrario (blue), an audiovisual editor from Argentina; and Mateo Fernández Gómez (purple), an advertising art director from Colombia. Gómez said a friend called to tell him about the project, saying the organizers needed a gay Colombian to don the country’s purple jersey to complete the flag. Gómez said he agreed to participate because he thought it was “a really cool idea,” not because he had the urge to protest. When he arrived in Russia, however, he said everything changed. Despite their colorful protest, Gómez said most of the passersby in Moscow didn’t even notice the rainbow jerseys’ LGBTQ significance. He said people took photos of them mainly because they were surprised to see competing fans hanging out. Russia effectively silenced public displays of LGBTQ pride in 2013 by outlawing “propaganda of nontraditional sexual relations” to minors. Gay pride parade requests are repeatedly denied, and a number of LGBTQ activists have been convicted under the propaganda law.